September 22, 2018 from 10 a.m. to 4 p.m.
Join us for a daylong celebration of all things Scotland! Taking inspiration from the bestselling Outlander book series by Diana Gabaldon, the day will feature music concerts, crafts, magic, demonstrations, historical talks, and more. This event is sponsored by the Ocean County Library Foundation. The Celtic Knot Fish and Chips food truck will be on hand for attendees to purchase food. Central Jersey band Sons of Wexford specializes in classic Irish and Celtic folk music. Since 2008 they have been entertaining audiences with their unique blend of instrumental melodies and rich vocal harmonies. The Doyle family band is sure to have you dancing and singing along! Magic is exciting on any stage, but when it is experienced one-on-one, it creates a memory that a person will hold onto for a lifetime. In this style, which adds an exciting ambiance to any event, Daniel GreenWolf takes magic to small groups and performs small sets that require the audience to fully participate and become part of the magic. See what your future has in store with a fun tarot or rune reading. Sign up for a 15 minute appointment in the lobby on the day of the event. The wit and wisdom, humor, horror, and humanity of a people are shared by storyteller David (MacCaffrey) Emerson who retells (and embroiders) the colorful and ancient tales of Ireland, Scotland, Wales, and Cornwall in a presentation that will “warm, tickle, or chill the heart.” David spins traditional lore of fairies, ghouls, ne’er-do-wells, tricksters, banshees, heroes, and liars, plus original stories with an Irish tint. Herbal Medicine has been used for hundreds of years and many of our modern medicines are derived from these natural wonders. Today, herbal medicine is again on the rise, and many of these plants can be found growing in your backyard! Join us as we discuss the some of the history of this craft, the plants you can use, and how to prepare them. Meet Bonnie Green, professional kiltmaker, and learn about the history of tartans and how kilts are made. Bonnie will have some beautiful samples of kilts, tartan swatches, and even reference books to help you find your family’s clan tartan. 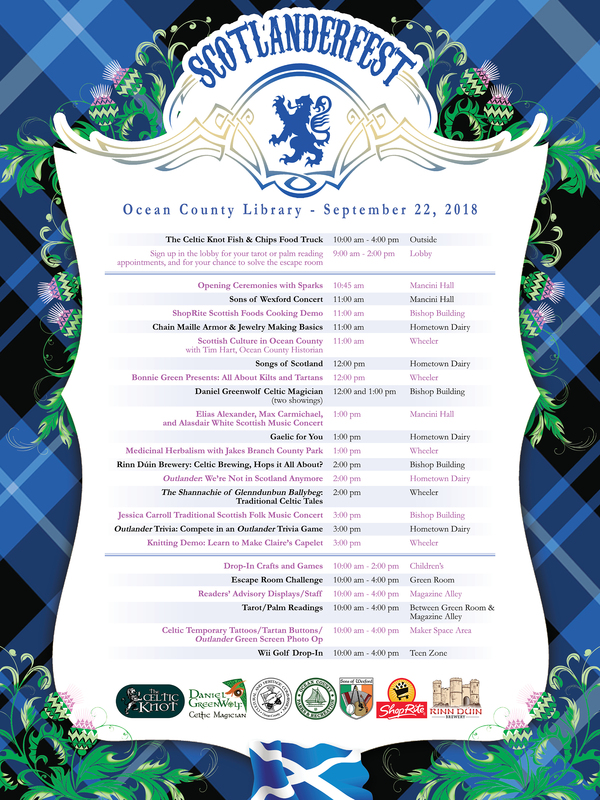 Ocean County Cultural and Heritage Historian Tim Hart will present a historical talk about the Scottish culture in Ocean County. Join Perlmutter ShopRite’s registered dietitian Giavonna Hirtes for a Scottish inspired cooking demonstration, and a healthier take on some classic dishes. Three talented Scottish musicians well-versed in the traditional song and dance music of Scotland, will delight you with their gaelic tunes. Local musician Jessica Carroll, armed with her guitar and beautiful voice, will be performing traditional Scottish Folk music. Stop by our displays for some great book picks on a variety of Scotlander subjects! All books will be available to check out with your library card. Visit the Children’s Area for Scottish crafts and games! Head over to our Teen Zone to try your hand at Wii Golf, a modern way to play one of Scotland’s favorite sports. Compete against other fans in a fun Outlander-themed trivia game. A brief fun introduction to the first language of the Scots! Join us for a quick look at and listen to this fascinating language! You’ll be speaking a new language before you know it! John Grimaldi, who will lead this workshop, has studied Gaelic in New York, North Carolina, Nova Scotia and Scotland. Sing with us - or just listen to songs of Scotland’s rich musical heritage! Songs in Scots, Gaelic and even English! Some old favorites and others you’ll love at first sight - I mean, first hearing! John Grimaldi, award-winning Gaelic singer, will lead this entertaining workshop! Rinn Duin Brewery: Celtic Brewing, Hops It All About? Beer has been brewed and enjoyed almost as long as mankind has walked the earth, and some Celtic recipes date back almost 5,000 years. Join Rinn Duin – a Celtic-influenced brewery in Toms River – to learn the history of Celtic beer, what makes their beer traditionally Scottish & Irish, as well as the brewing process. Sláinte! Take a picture with life-size Jamie and Claire from Outlander or create a scenic picture in Scotland with our green screen. Create a button with your choice of tartan pattern and heraldry symbols. Get your very own Celtic inspired temporary tattoo. **Note that on Saturday, the upper level of the municipal garage behind the library is FREE, not metered, courtesy of the Ocean County Library. Scotlanderfest: A celebration of all things Outlander and Scottish where fans can gather together. The event will include Scottish music, a kilt demonstration, tarot card readings, an escape room, and more. Everyone is welcome! Scotlanderfest is FREE and open to the public, though you will need to register for tarot card readings and the escape room. You do not have to be a resident of Ocean County. What can I do at Scotlanderfest? The event begins at 10am on Saturday, September 22 with an opening ceremony. Programming, workshops and demos will be held throughout the building until 4pm. Special guests on Saturday include a Scottish Pianist, a kilt maker, a food truck, and a tarot card reader. There will be panels and workshops covering such topics as Outlander, Scottish music, chainmail demos, crafts, Escape Rooms, cooking, Celtic tales, and much more. Who can I expect to see at Scotlanderfest? Outlander is a popular book series by best-selling author Diana Gabaldon. In 2014 Gabaldon’s book series was turned into an award-winning TV show on the STARZ network. I’ve never read the books or seen the show! Can I still attend? Of course! Scotlanderfest is for everyone who loves Outlander as well as everything Scottish. There are a few activities that require registration: tarot card reading and the Escape Room for instance. You can register on site at the library on Saturday. Can I come dressed for the event? Yes! When planning your Scottish and/or Outlander attire, please be aware the library’s code of conduct will be enforced. Proper attire, including shoes and shirts, must be worn. Carrying weapons is not permitted. ANY prop weapon must be obviously fake, or it may be subject to confiscation for the length of the event. No, but we hope you do! You are welcome to come for just one program or stay for the whole day. If you are thinking of coming early, note that the library doesn’t open until 9 am and programming won’t start until 10 am. The library closes at 5 pm. The library’s code of conduct will be enforced throughout Scotlanderfest. You can read the Code of Conduct here.